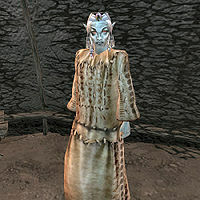 Nibani Maesa, a Dunmer wise woman, is the Urshilaku Ashlanders' Farseer. She can be found in the Wise Woman's Yurt at the Urshilaku Camp. She is considered a leader and guardian of the Nerevarine Cult. She has also come into possession of the Valenvaryon Propylon Index, which she will be willing to sell if you have the Master Index plugin installed. She also sells basic Restoration potions and alchemical ingredients. Maesa is a vital character in the Main Quest, and is your guide throughout your fulfillment of the Nerevarine prophecies. She wears an expensive robe and carries two cure blight disease potions with her. Aside from her natural resistance to fire and the sanctuary provided by her ancestors, she knows the following spells: Shield, Purge Magic, Divine Aid, Orc Strength, Powerwell, Quicksilver, Restore Endurance, Restore Luck, and Restore Willpower. "You are in the wrong place, outlander. Leave, now." "Will you say you are deaf? Or stupid? Or rude? How do you explain? I have told you. You are in the wrong place. I told you to leave. But you are still here." "Go ahead. Do you have questions about the Nerevarine prophecies? Have you come to see if you pass the test? Do you think you are the Nerevarine?" "Go ahead. Do you have questions about the Nerevarine prophecies? Or other questions to ask me? Or do you bring me news of the lost prophecies?" "I am ready to give you my judgement." "I shall be your guide to the Seven Trials on the path of the Nerevarine. Ask, and I shall answer, with Azura's blessing." "I am concerned. Why have you not yet fulfilled the prophecies of the Nerevarine? Have you done something wrong? Have you forgotten your destiny? I have heard that the leader of the Temple, a man named Tholer Saryoni, is desperate, and asks that you come speak with him at the High Fane in Vivec City. Please. If there is some problem, go to Saryoni. Perhaps there is still hope." Ahemmusa: "The Ahemmusa of the Grazelands are mild and peace-loving. The wise woman of the Ahemmusa, Sinnammu Mirpal, is also their ashkhan." arrange a meeting: "The Urshilaku will never meet with an Argonian Sorcerer." aspect and uncertain parents: "If what you say is true, you are indeed born on a certain day of uncertain parents. This is part of the prophecy. But many have the same birthday, and many are not sure of their parents. It is interesting. But it does not make you the Nerevarine." birthsign: "In Tamriel, persons born under certain constellations are said to be 'fortunate in their aspects'. Such persons are often blessed -- or cursed -- with remarkable abilities or weaknesses as a result of the magical conjunctions of celestial influences." "These dreams are the black lies of the Sharmat Dagoth Ur. Dagoth Ur himself is mad. He is dead, but he dreams he lives. He hears laughter and love, but he makes monsters and ghouls. He woos as a lover, but he reeks with fear and disgust. Do not listen. Do not go to him." Erabenimsun: "The Erabenimsun of Molag Mar love themselves and their weapons above all else. Their Ashkhan Ulath-Pal is cruel and ambitious, and his gulakhans are just like him. Their Wise Woman, Manirai, is cautious and reasonable. Seek her counsel. Don't waste your speech on the war khans." "The Ashlanders are sometimes called the Velothi, for the prophet Veloth who guided us to this land many, many centuries ago. And the Four Tribes are the four tribes of Vvardenfell, the Urshilaku, the Ahemmusa, the Zainab, and the Erabenimsun. It would truly be a miracle to unite these four tribes who have so long raided and warred with one another. But the Nerevarine must be one who performs miracles." "This refers to your birthsign -- to your birth on a certain day to uncertain parents, just like in the Stranger prophecy." "A "Hortator" is a war-leader chosen when Dunmer great houses must put aside their normal feuds to unite against a common enemy. This has not happened since the Empire invaded our land." "There are Nerevarine prophecies that have been lost. The Seven Curses. And others. Some are forgotten. Some hidden. Some deliberately lost. The wise women are the memory of the Velothi people. But it is a faulty memory, and we are mortal, and our knowledge dies with us. But we hear that the Dissident Priests of the Temple study our Nerevarine prophecies, and record them in books. Such written words never die. You must go to them and ask for these books, and bring what you find to me." "You have these lost prophecies? You will tell me these things, over and over, until I have them by heart. And then you will tell me what these priests say, what they see in these words. And then, you must leave me. Hunt. Sleep. Train. Feed. Learn the land. I must bring these things into me, and place them before my ancestors, and listen to them, and to the skies and stars of my dreams. And then, when the moons have come and gone, return, and I will give you my judgement." "You have told me of these lost prophecies." "The ancestors and stars have given me clear signs. The lost prophecies leave no doubt -- the Incarnate shall be an outlander. You, blessed by Azura, must lift the seven curses of Dagoth Ur. Prophecy has shown the seven steps of the Nerevarine's path, and I have been chosen as your guide for each step on that path. I will read the signs, and show you the way. It is time for you to walk the path of the Seven Visions, and pass the Seven Trials of the Seven Visions. You are born on a certain day to uncertain parents. So you have passed the first trial. My dreams show me that you also fulfill the second trial, that 'neither blight nor age can harm him/The Curse-of-Flesh before him flies'. I have read the signs, but I cannot understand. Can you explain this to me?" "That you have overcome the Curse-of-Flesh is strange enough, but that it should protect you from blight and age is past belief. Yet the signs of my dreams are clear. You have passed the second trial. But the third trial is unfulfilled. The mystery of the third trial is not my secret to share. Go to Sul-Matuul, the guardian of our cult, and he shall tell you of the third trial. When you have fulfilled the third trial, return to me for guidance on your next steps on the path of the Nerevarine." "Sul-Matuul shall tell you of the third trial, and I shall guide each of your steps on the path of the Nerevarine." "There are many Nerevarine prophecies, and they suggest many things. Aspect and uncertain parents. The moon-and-star. Sleepers. Seven curses. The curses' bane. The prophecy of the Stranger. The prophecy of the Seven Visions. The lost prophecies. Continue Ask me of these things. If you are patient. If you would be wise. Or, if you are impatient to know, just ask: 'Do I pass the test of the Nerevarine prophecies?' Go ahead, outlander. I am the wise woman. Ask your questions. And I will answer." "I will give you what counsel I can. But I only see what may be, not what must be." "Now, with the lost prophecies, much is revealed. You, the 'Outlander Incarnate beneath Red Mountain', must face Dagoth Ur to lift the seven curses of the Sixth House -- Curse-of-Fire, Curse-of-Ash, Curse-of-Flesh, Curse-of-Ghosts, Curse-of-Seed, Curse-of-Despair, Curse-of-Dreams. To remove these curses, you must go to Red Mountain and defeat Dagoth Ur and all his hosts. It is an unspeakable task. But perhaps, with Azura's blessing, at least we have hope." One destiny: "Veloth's people are the Dunmer, all Dunmer, Ashlander and Great House. The last time the Velothi were united were with Nerevar at the Battle of Red Mountain. Now Nerevar will come once again and unite the Dunmer. He will restore Morrowind to the Dunmer, and restore the former greatness of the Velothi people." [The Seven Visions has been added to your inventory. The Stranger has been added to your inventory.] "You are not the Nerevarine. You are one who may become the Nerevarine. It is a puzzle, and a hard one. But you have found some of the pieces, and you may find more. Do you choose to be the Nerevarine? Then seek the lost prophecies among the Dissident priests of the Temple. Find the lost prophecies, bring them to me, and I will be your guide. And take these copies of the Stranger and the Seven Visions. Now. I have told you all I know. Go. Think on what I've told you. And do what must be done." "I have told you all I know. Go. Think on what I've told you. And do what must be done." "I'm not sure what this means. Will the Nerevarine come as a spirit who is not harmed by blight or age? I don't know. But I think Curse-of-Flesh means the blight disease corprus, which causes terrible, distorted growths on its victims. Perhaps the Nerevarine can heal this disease. Perhaps that will be a sign of the Nerevarine." "That you have overcome the Curse-of-Flesh is miracle enough, but that it should protect you from blight and age is past belief. Now the signs of my dreams are clear. You fulfill the second trial." seven curses: "It is another Ashlander prophecy of the Nerevarine. It is called "The Seven Curses of the Sharmat." But I do not know it, and I know no one who does. It may be lost. Such things happen. A wise woman dies, or forgets, or a clan is wiped out. Perhaps someone knows, but is keeping it secret. Perhaps it is in one of those many books of your settled peoples. I have heard that the Dissident priests of the Temple may have such books." "The Incarnate cannot fail. What others have tried, he will do. What Nerevar started, the Incarnate shall finish." "'The cursed false gods' must be the Tribunal. They are surely false gods, evil sorcerers and necromancers, and they murdered Nerevar so they might set themselves up as gods. "Binds the broken" must refer to Nerevar's broken promise to the Ashlanders to honor the ways of the Spirits and rights of the Land." "I am not sure. "The tribe unmourned" may mean the Sixth House, House Dagoth, which was exterminated after the Battle of Red Mountain. But it may also mean the Dwemer, or the Dwarves, as Westerners call them. And "eating sin" is doing atonement for another's sin." "Rumors say that in the towns, mad cultists called "sleepers" are attacking people, saying that Dagoth Ur has awakened, and will drive the outlanders from Morrowind. Perhaps it is just a coincidence. But I think it is a sign of the Nerevarine. Not necessarily a sign that YOU are the Nerevarine. Perhaps the time of the Nerevarine has come. And you have come at the same time. This is not passing a test. But it may mean you have some part to play in the coming of the Nerevarine." "This is a common phrase among wise women, meaning that dreams are the door to the visions of prophecy." "You say the star is the key, Azura's Star? Then the door is only seen at dawn and dusk, and the star is the 'key' that opens it." "Legend says Indoril Nerevar's family standard bore the moon and star, and Nerevar's armor and weapons bore this sign. Some say he bore a moon-and-star birthmark. Some say he has a magic ring marked with a moon-and-star. Others say he was born under a moon-and-star. In any case, I think the moon-and-star is the mark of the Nerevarine, and you do not have this mark. So you are not the Nerevarine." "The full title of the prophecy is "Seven Visions of Seven Trials of the Incarnate". Listen, and I will tell you the verses. What he puts his hand to, that shall be done. What is left undone, that shall be done. The Curse-of-Flesh before him flies. In caverns dark Azura's eye sees and makes to shine the moon and star. He honors blood of the tribe unmourned. He eats their sin, and is reborn. He speaks the law for Veloth's people. He speaks for their land, and names them great. What does this prophecy mean? It tells us who the Nerevarine will be, and the trials he must undergo before he fulfills his destiny. Some parts I understand. Some parts I do not. I will answer your questions as best I can. But I cannot pretend to understand it all." "This is the best known of the Nerevarine prophecies. We call it 'The Stranger'. the star is the key: "Ah. The star is Azura. Azura's Star appears in the sky only in the magical hour between day and night, at dawn and twilight." Journeyed for 'neath moon and star. "In legend there is a shrine to Azura called the Cavern of the Incarnate. There are secrets I may not tell you about this cavern. Do not ask." "Sul-Matuul has sent you to seek the Third Trial. He has told you of the shrine to Azura called the Cavern of the Incarnate. I cannot tell you how to find this place. But he has said you may seek the wisdom of the tribes, and the wisdom of the wise woman I may share with you. Perhaps what I know can help you with these lines of the riddle: the star is the key, and the dream is the door." Urshilaku: "The Urshilaku are the Ashlanders of the northern Ashlands and the West Gash. I am the wise woman of the Urshilaku, and Ashkhan Sul-Matuul is our chief, a brave and respected war leader, and Warrior-Protector of the Nerevarine cult." Zainab: "The Ashlanders of the Zainab tribe are sly and crafty. Their camp is in the interior of the Grazelands." With the Master Index plugin installed, Nibani will also sell Miscellaneous Items in addition to ingredients and potions. This is a side-effect of making her able to sell the Valenvaryon Propylon Index. This page was last modified on 23 November 2018, at 06:19.